Driving fans will be treated to a thrilling Final for the 10th season of the FEI World Cup™ Driving series in Leipzig, Germany, from 27 April to 1 May 2011.Five of the seven four-in-hand drivers who will start in Leipzig have already won a World Cup round this season, highlighting the incredible level of skills for this year’s FEI World Cup™ Driving Final. The finalists will all start from scratch and, as this year’s series was so tightly contested, it won’t be until the very last second of the Final on the afternoon of Sunday 1 May that the new World Cup Champion will be announced. British-based Australian driver Boyd Exell – double World Cup champion and gold medallist at the Alltech FEI World Equestrian Games™ in Kentucky last year - will be aiming for a hat trick in Leipzig. Exell has won three out of the six competitions this season and was runner-up three times, but he will be facing up to the strongest ever indoor opponents. 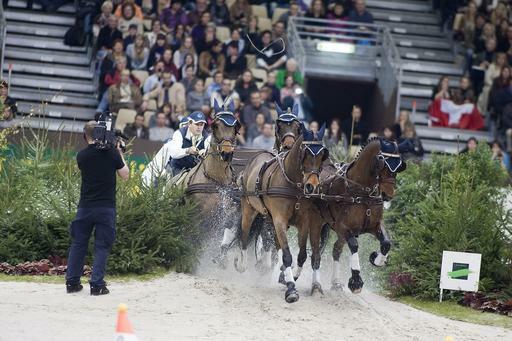 Dutch driver Koos de Ronde, runner-up in the 2010 final and winner at this year’s FEI World Cup™ Driving competition in Mechelen for the third time in a row, has his sights set on the overall series title once again. De Ronde is a very fast driver and will certainly give Exell a run for his money in Leipzig. Switzerland’s Werner Ulrich beat Exell in Budapest where he claimed his second FEI World Cup™ Driving win in his 31-year long career. 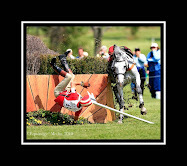 His clear and steady style always ensures top placings and he too will be one to watch at the Final. While De Ronde’s compatriot IJsbrand Chardon did not manage to beat Exell this season, the four-times World Champion showed his colours by winning in Bordeaux when Exell was not in the startlist. He is in top form this season and has the Leipzig title firmly in his sights. Hungary’s Jozsef Dobrovitz, who sold his team to Chardon last season, used Mechelen to try out his new leader horse and demonstrated that he now has an extremely fast team ready for Leipzig. Tomas Eriksson from Sweden beat Boyd Exell on home soil in Stockholm and, by taking second place in Bordeaux, the double World Champion earned the last ticket for the Final. Fans are looking forward to seeing him compete after his dashing performance in Bordeaux. The last remaining slot for the Final goes to 29-year-old German four-in-hand driver Christian Plücker, who won the special indoor competition at the national equestrian centre in Warendorf on 20 February to claim the wild card for Leipzig. All seven drivers have equal chances to win at what will be a riveting 10th Final of the FEI World Cup™ Driving! The warm-up competition scheduled for Friday 29 April at 21.45. will decide the starting order for the Final on Sunday 1 May at 11.30. World Championship and World Cup course designer Dr. Wolfgang Asendorf from Germany will be responsible for the courses in Leipzig. The competitors will drive the course once on Friday evening and then compete over the same course on Sunday morning. The top three drivers from the first round on Sunday qualify for the winning round, which takes place immediately afterwards over the same course. 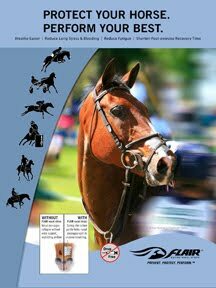 The times of both rounds are then combined and the driver with the fastest time will be declared FEI World Cup™ Champion 2010/2011. Leipzig has an amazing array of equestrian entertainment on offer with the first-ever four-time FEI World Cup™ Finals all under one roof. As well as the Driving action, equestrian fans will also be flocking to the Rolex FEI World Cup™ Final Jumping, the Reem Acra FEI World Cup™ Final Dressage and, a newcomer to the FEI World Cup™ stable, Vaulting. It promises to be a really thrilling six days!